The Precision Reflex Gas Buster AR-15 Charging Handle has a special gas deflection groove that deflects gas blowback, oil, or other debris away from the shooter’s face. A PRI Gas Buster will help protect you in the event of a blown case, failed primer, or some other cartridge failure. 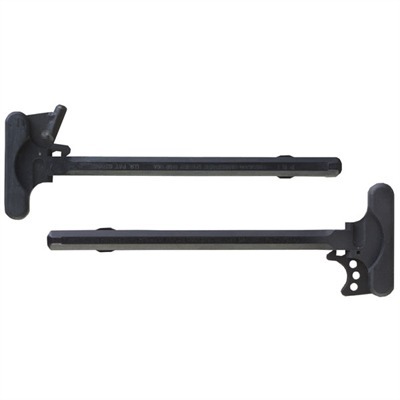 PRI machines each Gas Buster charging handle from extra-strong 7075 T6 aluminum alloy, with extra metal at stress points to resist twisting or, even worse, breakage under hard use. A matte black hardcoat anodized finish helps prevent surface wear. The latch itself is made of steel so this small but critical part won’t fail you at the wrong time. All versions of the Precision Reflex Gas Buster AR-15 Charging Handle are designed to help you operate the handle reliably and quickly under stress, when crucial seconds make all the difference. SPECS: Aluminum, hardcoat anodized, matte black. AR-15/M16 models are compatible with AR-15/M16 uppers.